191 countries demand the end of the Blockade of Cuba — and YOU, too! the US Blockade of Cuba. Keep the pressure on Pres. Obama and Congress. Read “Obama, Put Your Money Where Your Mouth Is — on Cuba”. Find out what Obama could do now — and isn’t. On Tuesday, October 27th, Cuba proposed, for the 24th year, a resolution called for the end of the United States economic, commercial and financial blockade. The 193 member assembly voted, 191 to 2, in support of adopting the resolution. More info. 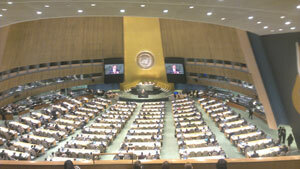 United Nations General Assembly during Ambassador Bruno’s speech. The Blockade is still hurting Cuba — US citizens, too. 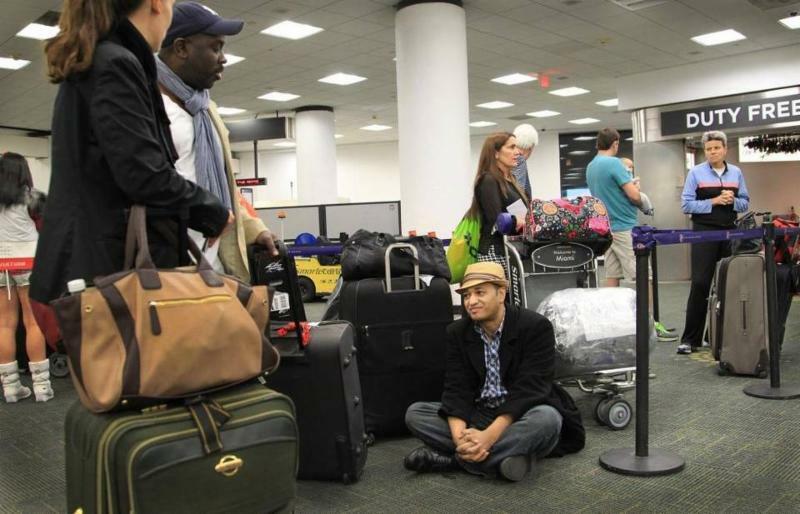 Travelers ‘stuck’ at the Miami airport, with canceled flights, because Blockade-wary banks are hesitant to transfer funds. Your donation helps IFCO continue organizing. We won’t stop until the Blockade is truly ended! This year marked the 24th year that the resolution was taken up for a vote. 191 of the 193 members, the largest majority, voted in favor of Cuba. The three former abstentions turned into votes with the majority by the Marshall Islands, Micronesia, and Palau; as all three nations recently established diplomatic relations with Cuba this year. This important change sent a clear message to the United States government that it is even more isolated from the rest of the world in its policy towards Cuba. Although the UN General Assembly resolutions are non-binding, this annual vote highlights the United States’ isolation on the issue. Only Israel joined the U.S. in opposing the resolution. The blockade and the ability to travel are squarely in the hands of the US government. We must officially end this 50 year collective punishment of our friends in Cuba. Let your representatives know!